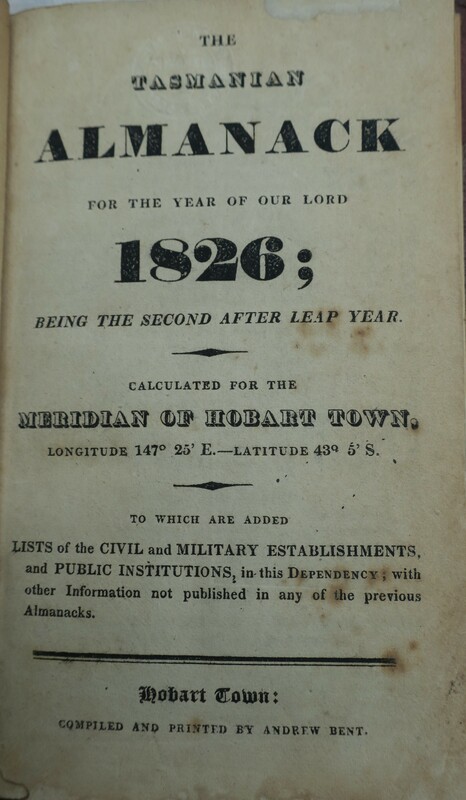 The Tasmanian Almanack for the Year of our Lord 1826; being the second after Leap Year. Calculated for the Meridian of Hobart Town, Longitude 147° 25′ E.—Latitude 43° 50’ S. To which are added Lists of the Civil and Military Establishments and Public Institutions in this Dependency; with other Information not published in any of the previous Almanacks. Hobart Town: Compiled and printed by Andrew Bent. 80 p., Cr. 8vo in fours (Wilson) pages 16.6 x 10.5 cm. approx. Marbled or blue paper wrappers, some stiffened. One copy in contemporary vellum binding (Wilson collection). Includes a directory, but no signal plate. Ferguson 1091. Copies: ANL; ANL (FC); BL (copy cannot be located); DC; ML; NSL; TSL; TU; Wilson collection. Published 17 Dec. 1825. Price 3/6. (CT 16 Dec. 1825). Facsimile edition published: Hobart: Melanie Publications, 1980. 184, ii p., 20 x 13 cm. Blue paper covers. Facsimile of Harvard copy available (print on demand) in MOML Making of the Modern Law: Trials, 1600-1926 series. Probably the longest pamphlet ever printed by Bent. Announced as ‘in the press’ on 6 Jan. 1826, with only a limited number to be printed. Published on 22 Mar. and advertised in CT 24 Mar. 1826, price two dollars. ‘Persons residing in the Country, who may order Copies, will be pleased to give a reference for the Payment on some House in Town, as none are Sold without the ready Money.’ Copies were also sold by John Fawkner in Launceston. Gellibrand was suspended from office in Feb. 1826. The inquiry examined a number allegations of improper professional conduct but the primary concern was Gellibrand’s suspect loyalties to Arthur’s government because of his friendship with Robert Lathrop Murray. Murray was a trenchant critic of the government as a correspondent to Bent’s newspaper, and then, from July 1825, as editor of it, and was probably the master-mind behind the publication of Gellibrand’s book. In the latter part of 1825 Bent had been convicted of libels against the government but not brought up for judgment. 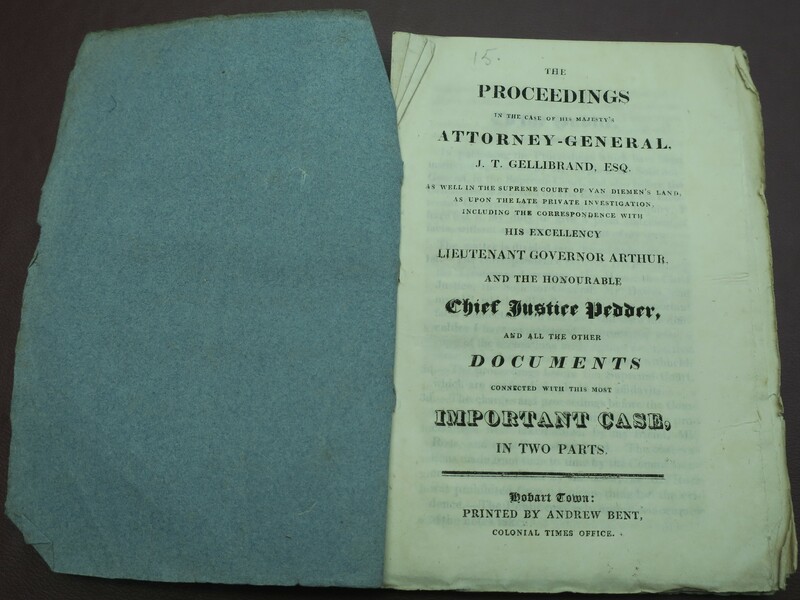 The very day Gellibrand’s book appeared he was served with notices to appear for sentencing on one of the informations and a retrial on the other. 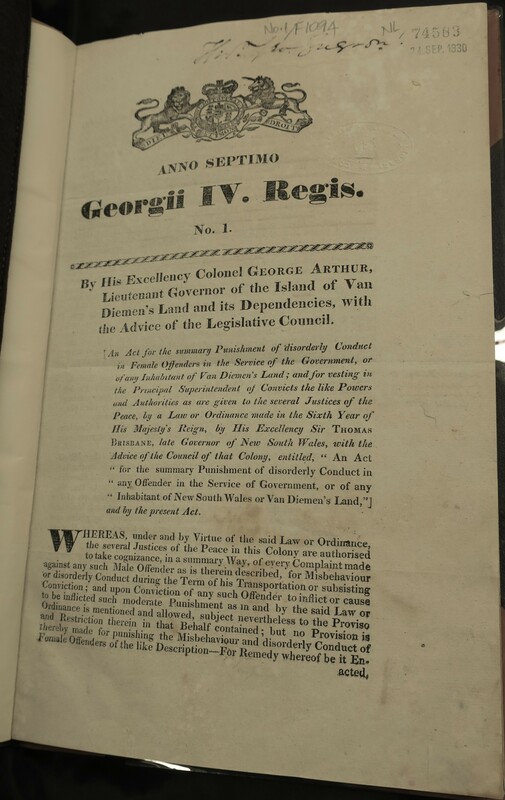 Minutes of the Van Diemen’s Land Company, established by an Act of Parliament, introduced by His Majesty’s Ministers and passed without any single Opposition in any one of its Stages. Together with a List of its Governors, Directors, Auditors, Officers, &c. Hobart Town: Printed by Andrew Bent, at the Tasmanian Patent Press, Colonial Times Office. 1826. 16p., 20.5 x 13 cm. (approx). Blue paper covers. Observations on the Establishment of the Wesleyan Library, at Hobart Town, Van Diemen’s Land. With the Rules and Regulations; a List of the Books collected; and an Appendix, containing some Account of Mr. Wesley, and the striking Success which attended his Ministry. Hobart Town: Printed by Andrew Bent. 1826. 16p., 18.3 x 12 cm. (ML copy, trimmed). Blue paper covers. Publication announced in CT 19 May 1826 (while Bent was in prison). 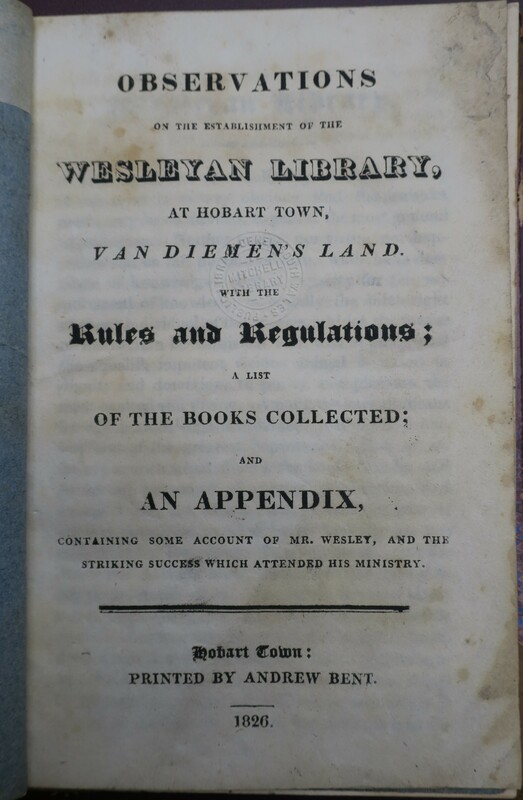 WESLEYAN LIBRARY.—An Institution, designated the “Wesleyan Library, at Hobart Town, Van Diemen’s Land,” has been during the present year instituted.—An interesting Pamphlet, containing observations on the establishment of it, with the Rules and Regulations, and a list of the Books collected, &c. has been printed at our office, under the Editorial Superintendence of the Rev. B. CARVOSSO. The expence of this little work did not exceed £4. The Wesleyan Library was the first community based library in Australia. [Second report of the Wesleyan Branch Missionary Society 1825] CT 16 June 1826 announced this ‘has just been printed at our office.’ Printed while Bent was in prison. Not in Ferguson. No known copies. [Van Diemen’s Land. Acts 1-3, 1826] Three consecutively paged, but separately printed, acts: no. 1 on punishment of female offenders; no. 2 on sale of liquor and regulation of public houses; no. 3 on the circulation of sterling money and regulation of promissory notes. 24 p. in all. Each act has colophon: Printed by A. Bent, Hobart Town, Van Diemen’s Land. no. 1; p. -3 (verso blank); no.2: p. -20 (verso blank); no. 3: p. -23 (verso blank), 31 x 19 cm. Laid paper with Britannia watermark dated 1820. ANL copy of no. 1 annotated and signed by Thos. G. Gregson. 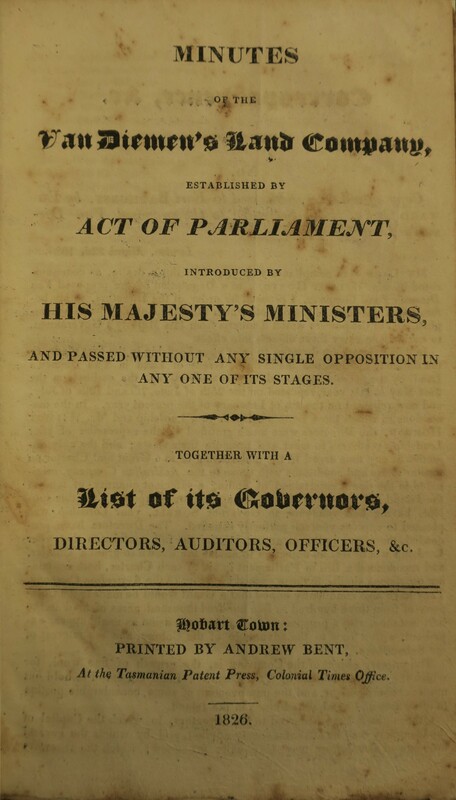 Now publishing, at the Colonial Times Offices, the Acts passed during the present Year, by His Excellency Colonel GEORGE ARTHUR, with the Advice of the Legislative Council. As all the future Acts of council will be printed at the Colonial Times Office, Persons desirous of possessing the whole, had better secure Copies of those now in print; as there are but a few Copies struck off, and as they may hereafter find a difficulty in procuring them. They are printed in a similar manner to the English Acts of Parliament, in order that they may be bound with them if required. Price, 1s. each, on delivery.